All organisms take in gases from their environment and release gases to the environment. Animals take in O2 for aerobic respiration and release CO2. Plants also respire, but during daylight hours they photosynthesise at a greater rate than they respire, and so take in CO2 and release O2. The body surface across which these gases diffuse into and out of the body is called the gas exchange surface. 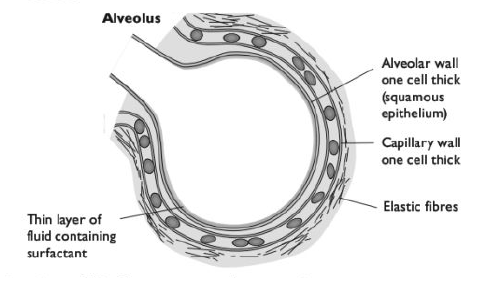 In mammals, including humans, the gas exchange surface is the surface of the alveoli in the lungs. 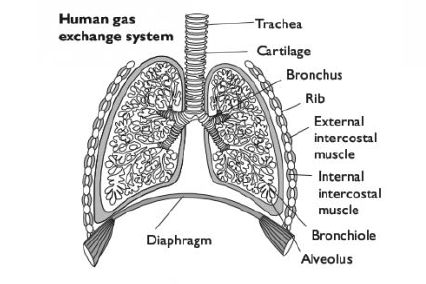 The gas exchange surface in the lungs is extensive, very thin, well supplied with blood and well ventilated. The trachea and bronchi provide little resistance to the movement of air to and from the alveoli. tubes collapsing when the air pressure inside them is low. helping to prevent dust particles and bacteria reaching the lungs. traps dust particles and bacteria. 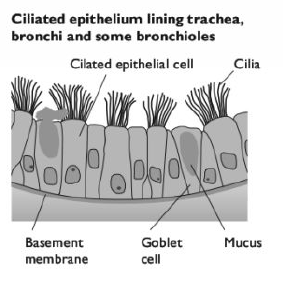 Smooth muscle cells are found in the walls of the trachea, bronchi and bronchioles. the tubes so more air can reach the lungs. The air inside an alveolus contains a higher concentration of O2, and a lower concentration of CO2, than the blood in the capillaries. This blood has been brought to the lungs in the pulmonary artery, which carries deoxygenated blood from the heart. O2 therefore diffuses from the alveolus into the blood capillary, through the thin walls of the alveolus and the capillary. 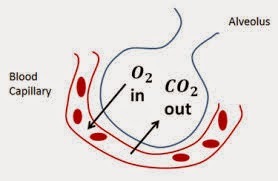 CO2 diffuses from the capillary into the blood. Air moves by mass flow into and out of the lungs during breathing. This is caused by the contraction and relaxation of external intercostal muscles and muscles in the diaphragm. When these contract, they increase the volume of the thoracic cavity and draw air down through the trachea and into the bronchi and bronchioles. When they relax, the thoracic volume decreases and air flows out, down a pressure gradient. The volume of air that is moved into or out of the lungs during one breath is called the tidal volume. It is generally about 0,5 dm3. The maximum amount of air that can be moved in or out during the deepest possible breath is called the vital capacity. It is generally somewhere between 3 dm3 and 5 dm3. 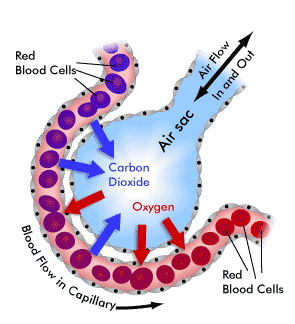 The gas exchange system is responsible for the uptake of oxygen into the blood and excreting carbon dioxide. An understanding of this system shows how cells, tissues and organs function together to exchange these gases between the blood and the environment. The health of this system and of the cardiovascular system is put at risk by smoking. Oh my Gosh THANK YOU SO MUCH! !